They do so because they’re pretty confident that Democrats won’t effectively raise a fuss, the media won’t care, and the public won’t know. And they’re right. But take a step back: how are Democrats supposed to effectively raise a fuss? Republicans can do it easily: they just start bleating, and within a few hours their complaints are splashed across Drudge, repeated on a 24/7 loop on Fox News, the topic of email barrages from conservative interest groups, and the subject du jour of every talk radio show in the country. At that point the rest of the media picks up on the story because “people are talking about it.” It’s making waves. Which is true: it really is making waves because this kind of attention gets the conservative base genuinely outraged. And if something is getting lots of attention, then that by itself makes it a legitimate story regardless of its intrinsic merit. But what megaphone do Democrats have? Virtually none. If they start complaining, some blogs will pick it up. Maybe Maddow and Olberman will talk about it. And that’s it. There’s no noise machine. And so there’s nothing to force the rest of the media to bother with it unless they decide the underlying story itself is important. 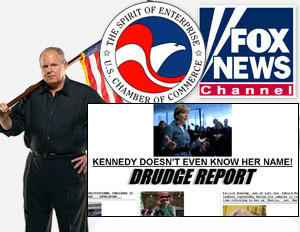 I don’t really want a liberal noise machine in America that’s on the same level as the Drudge/Fox/Rush noise machine. It would make life almost unbearable. But without it, Democrats will never be able to compete in the outrage department. As it is, they can complain all they want and the media will mostly yawn. But when Republicans do it, it’s a story. It’s hard to see that changing anytime soon.